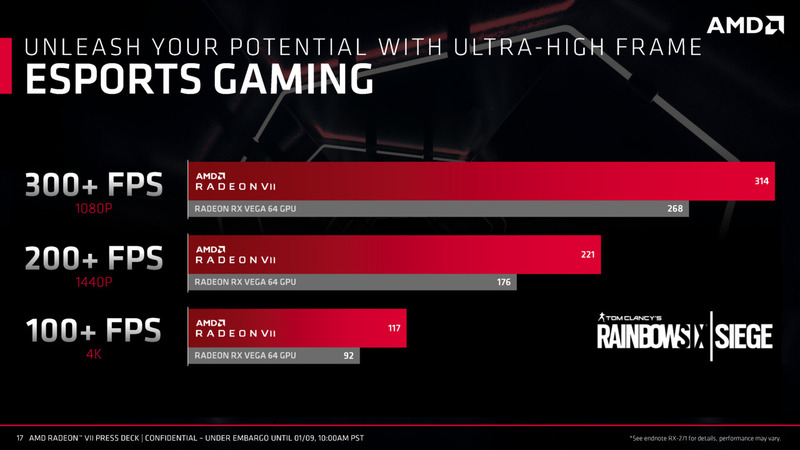 The AMD Radeon Vega VII gaming performance numbers and technical aspects of the Vega 20 7nm GPU have been detailed. 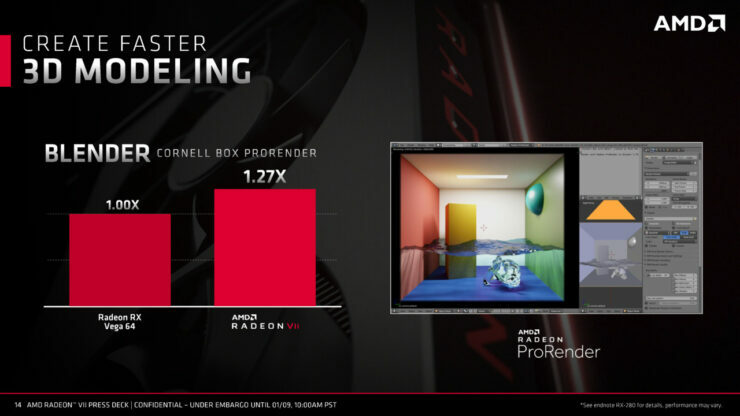 The latest details come straight from AMD and showcase various gaming performance numbers and also highlight the advantages of Vega 20 over Vega 10. 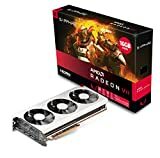 The AMD Radeon Vega VII is the continuation of Vega on a brand new process node and enhanced design. 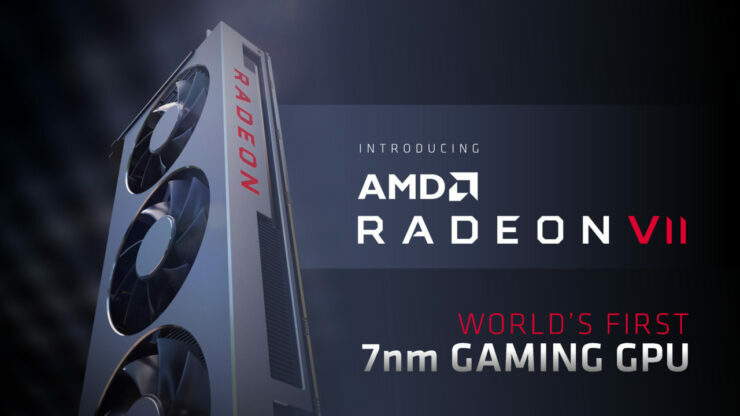 AMD launched their previous Vega graphics cards back in 2017 so this is a long time for the new high-end solution to launch, especially when NVIDIA has been out with their flagship offerings for quite a while. 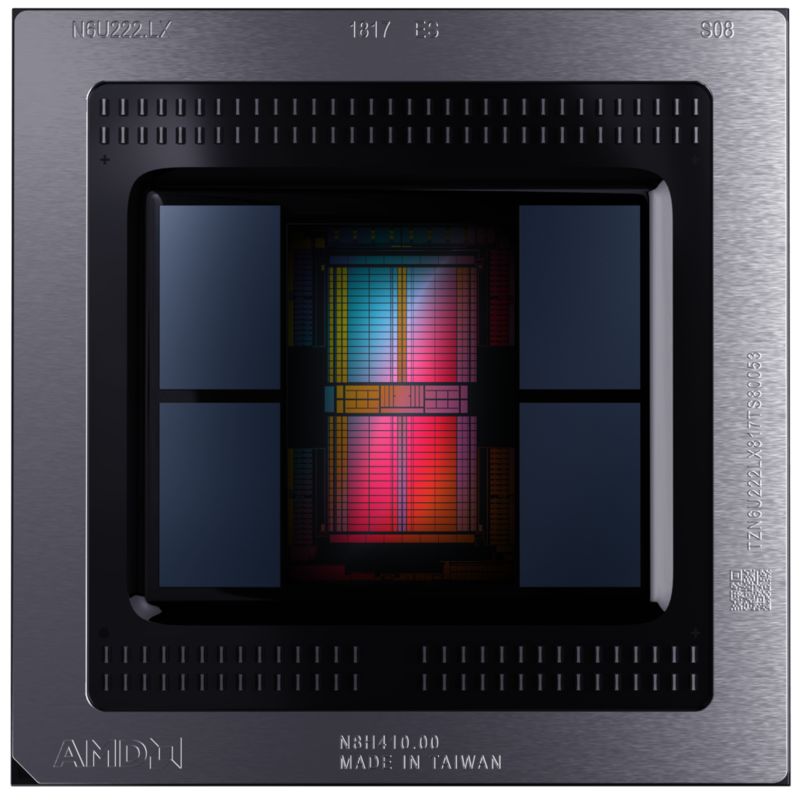 A quick recap of the specifications that were announced yesterday, the Radeon Vega VII is based on TSMC’s 7nm process node. 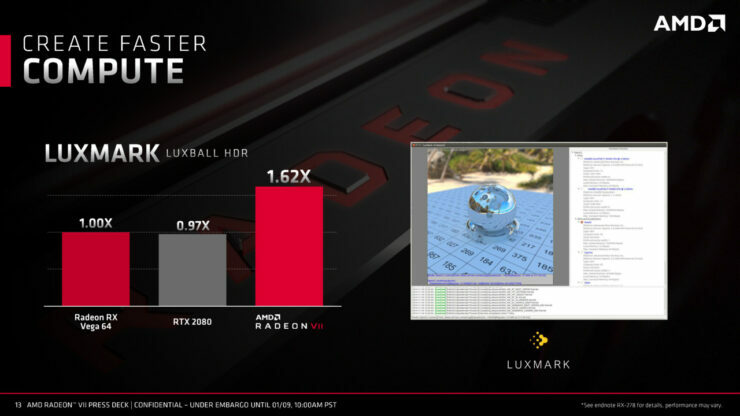 Thanks to the new process node, AMD is able to shrink the die size down to 331mm2 compared to 495mm2 of Vega 10. 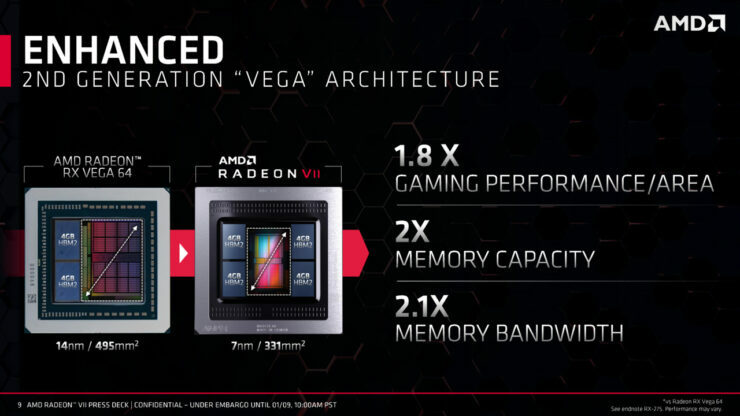 The Vega 20 package delivers 1.8X Gaming Performance/Area, 2x the memory capacity and 2.1x memory bandwidth. 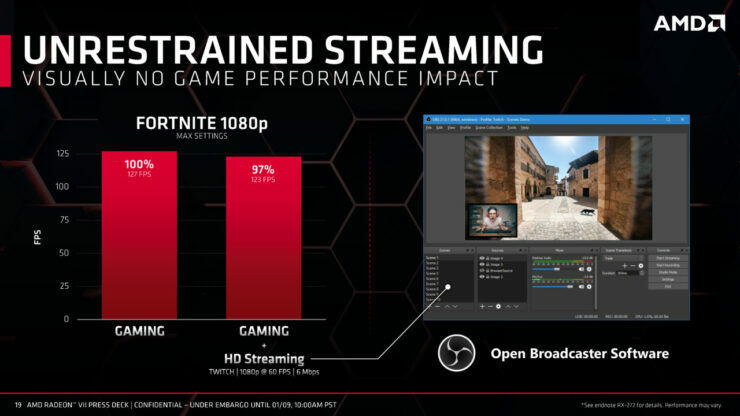 In terms of GPU config, we are looking at 60 Compute Units which equate to 3840 stream processors. The base clock is maintained at 1450 MHz while the chip can reach a peak clock of 1.8 GHz. This allows the card to pump out 13.8 TFLOPs of FP32 compute. 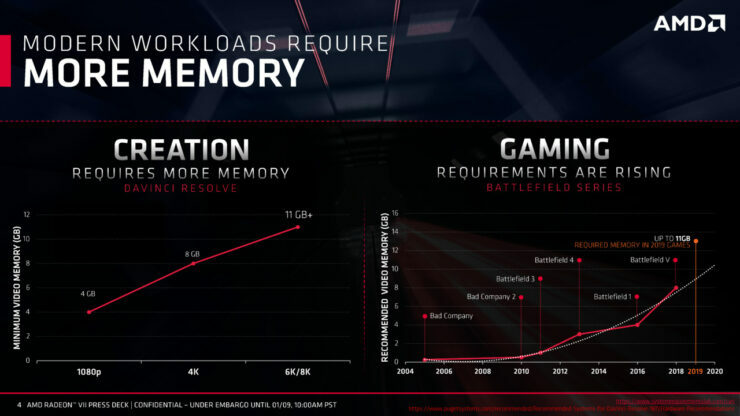 The memory side has seen a major uplift with the card featuring 16 GB of HBM2 VRAM across a 4096-bit wide bus interface. There are four stacks, each of which operates at 256 GB/s, delivering a total of 1 TB/s bandwidth. 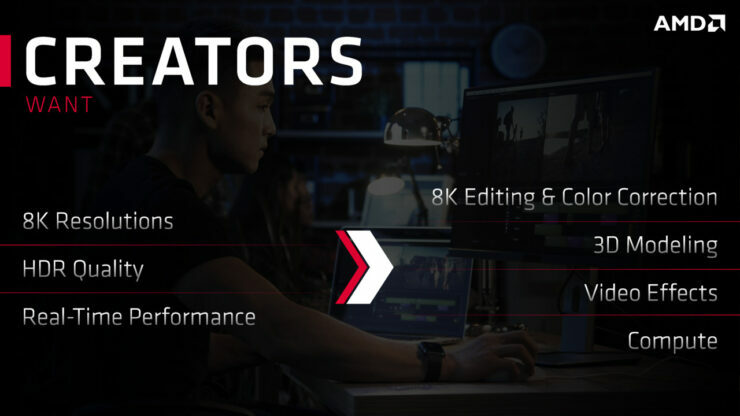 AMD states that the excess memory is useful for content creation and upcoming titles in 2019 can use up to 11 GB of onboard graphics memory. 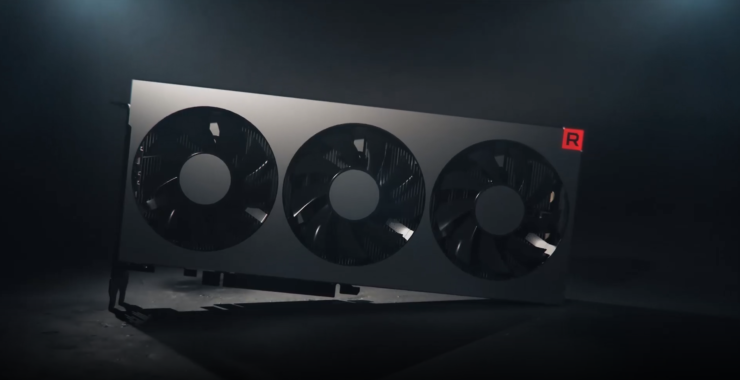 NVIDIA has their RTX 2080 Ti outfitted with 11 GB of memory and their Quadro parts come with up to 48 GB of VRAM. 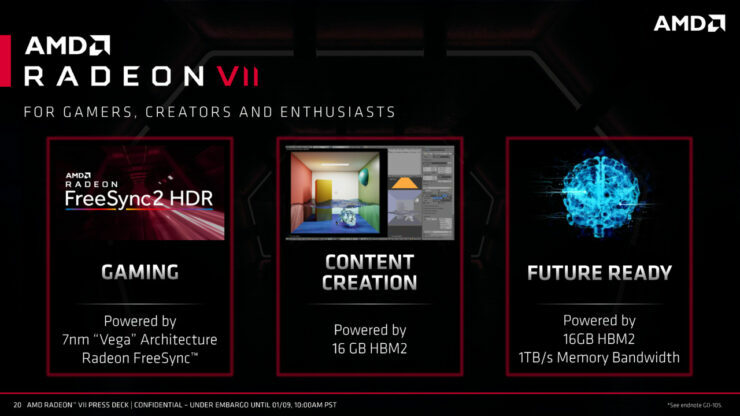 However, AMD is focusing on content creation with Radeon Vega VII as much as they are focusing on gaming. 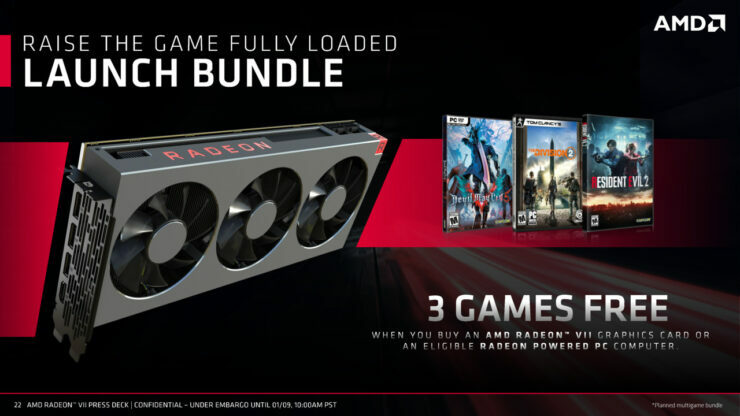 The inclusion of “RX” from this card might indicate that and it actually feels slightly like the Radeon Frontier Edition successor, aiming for the prosumer market. 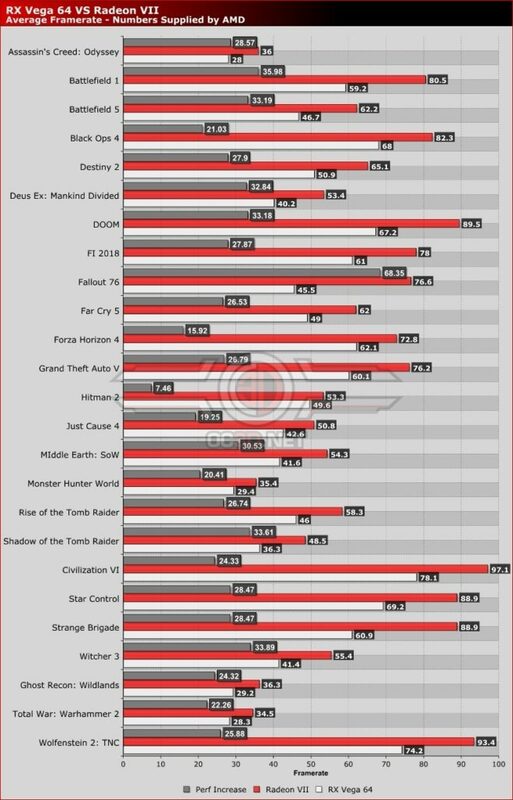 In many of the standard AAA gaming titles, the card features around 25% average performance uplift over the Radeon Vega 64 graphics card and up to 68% in Fallout 76 versus its predecessor which is one of the few extreme cases. 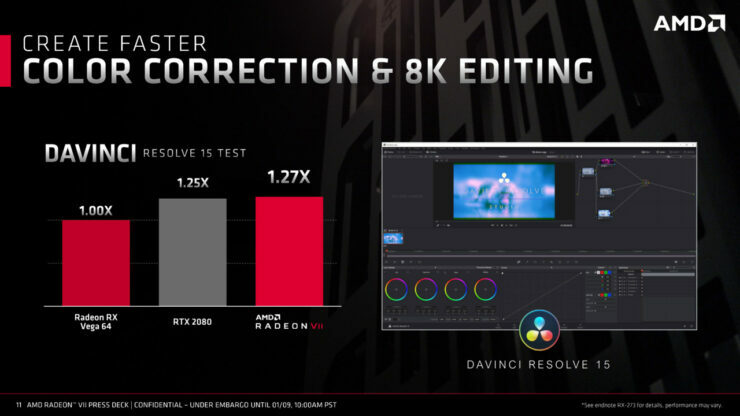 The following games were tested at 4K resolution but the actual settings were not disclosed by AMD yet. 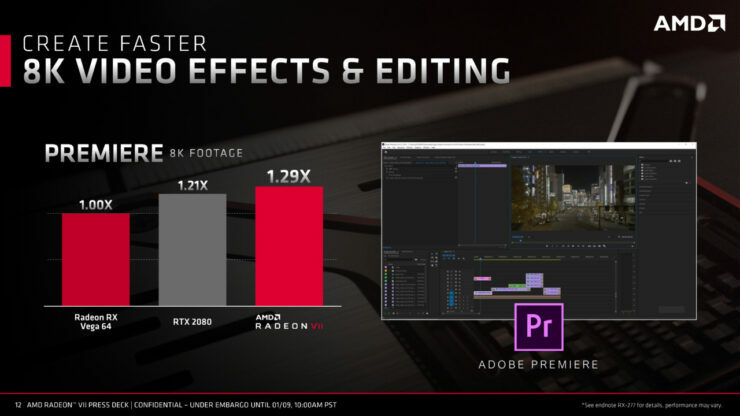 AMD even showcases various comparison charts in production benchmarks such as 3D Modeling (1.27x faster than Vega 64), Luxmark HDR (1.62x faster than Vega 64 and 1.65x faster than RTX 2080), Adobe Premier (1.29X faster than Vega 64 and 1.08x faster than RTX 2080), and DaVinci Resolve 15 (1.27x faster than Vega 64 and 1.02x faster than RTX 2080). 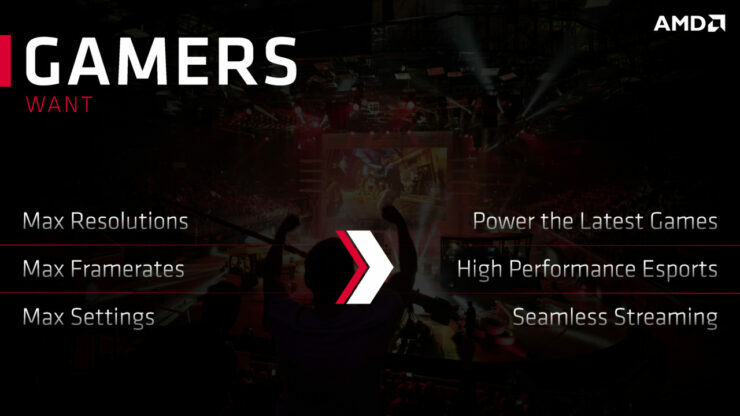 For gaming, AMD has noted the ESports gaming potential of their card, stating that Radeon Vega VII will be able to deliver up to 300+ FPS at 1080P, 200+ FPS at 1440P and 100+ FPS at 2160P in various Esports titles. The one which was tested here is Rainbow Six Siege so if we talk about something like Fortnite or CSGO, we can obviously tell that the framerate would be much higher. This basically warrants the purchase of a high refresh rate, adaptive sync monitor with the card to fully utilize its impressive performance potential. 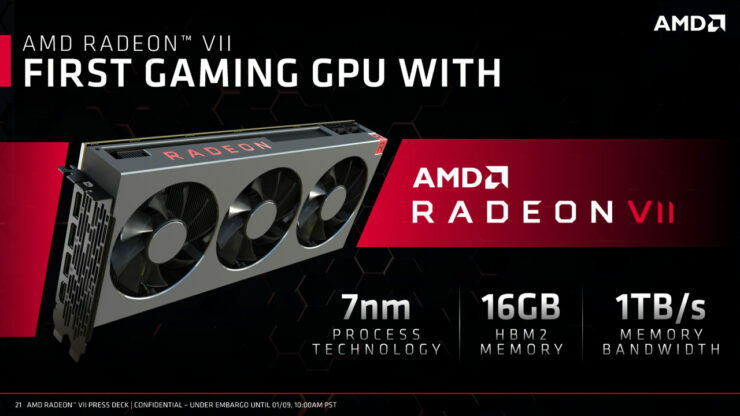 The AMD Radeon Vega VII graphics card is launching for market availability in February 2019 for a price of $699 US. 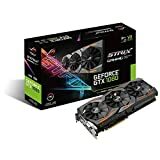 It’s definitely aiming for the enthusiast market where NVIDIA has placed their RTX 2080 and RTX 2080 Ti graphics cards. 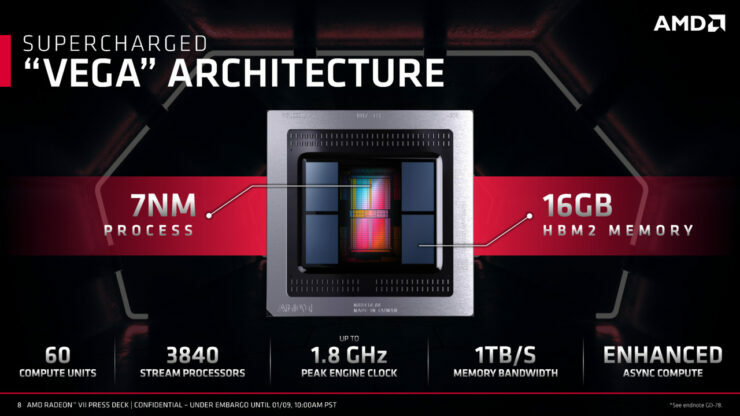 It will be interesting to see how the new AMD Radeon card competes with its RTX opponents at its price point. Also, do note that the GTX 1080 Ti is still a formidable opponent for the Vega VII graphics card, that launched back in early 2017. NVIDIA’s CEO has made some fiery comments on the new launch from AMD, even going as far as calling it underwhelming, read more details here.